Cottonmouths, aka water moccasins, get a bad rap. I have heard so many stories about people being chased by aggressive cottonmouths, most of which turn out to be ridiculously exaggerated. People also assume that any snake they see in the water – even a non-venomous Nerodia – must be a horrible ferocious cottonmouth. (How many Nerodia water snakes do you suppose have been killed as a result of mistaken identity?) Well, today I finally had a cottonmouth encounter of my own, and guess what? I left it alone, and it left me alone. It definitely did not chase me down the trail. I actually saw this snake twice today. My second morning class was forest ecology with a group of fifth graders, and I had walked right past this guy (who was coiled on a log on the left side of the trail) without seeing him when I heard one of the boys say “Oh, hey, a snake.” The kids and their chaperons did a great job of staying calm when I asked them to stand on the opposite side of the trail from it and briefly talked about venomous snakes before moving on, all the while mourning the fact that I didn’t have my camera with me. At that point I wasn’t 100 percent sure what specific kind of venomous snake this was; the dark lines extending back from the eyes made me think diamondback rattlesnake, but I couldn’t see any buttons on the tail. So, I did some horse trading with my coworkers to get a second forest class after lunch, this time with high school students. I stuck my camera in my pocket beforehand, and lo and behold, the snake had not moved an inch in the two or three hours since I passed it the first time. Score! (At least one other group apparently walked right past it in the interim without spotting it.) Now I had a photo to show my boss and fellow instructors, and finally we established that it was a cottonmouth. According to Wikipedia, “the majority of specimens are almost or even totally black,” making this guy’s gorgeous golden-brown hue unusual. And this wasn’t a young specimen who’ll get darker with age, because the same article adds that the tail doesn’t turn black until adulthood – my photo clearly shows the black tail. The subspecies found in Florida and the southern end of Georgia is supposed to have facial markings consisting of “dark brown postocular stripes that are bordered above and below by narrow light lines.” Check. I know that a lot of people wouldn’t consider coming within a few feet of a highly venomous snake something to be celebrated, but it totally made my day. I give these animals the respect and space they merit, but I also think they’re extremely cool. During college we used to jump off a bridge into the black darkness of what I think was the Lumbee River. A naturalist friend told me to stop and took me to take a closer look off that bridge. There were water moccasins hanging from some of the trees. He said that particular spot is famous with locals because of the snakes. I took his advice. Around here everyone sees copperheads. (they are mostly immature black snakes or some other brown snake. Way back when I was inspecting bridges in rural Maryland. I remember reading one of the reports that said that a “pit viper” was living in one of the bridge abutments. I didn’t know what the heck that was, but I knew I didn’t want to meet it! I’ve seen rattlesnakes here while hiking- one actually rattled to warn me. I like to think they want no part of an encounter with us, just as we really don’t want to mix it up with them. Nice shot, even if it is fuzzy. Thanks for working on dispelling some of the Cottonmouth myths out there. Many are firmly entrenched, for example, there are two Cottonmouth myths touched upon in the comments (no offense Mike and Nellie). For example, Cottonmouths don’t occur naturally north of Virginia and they rarely, if ever, climb trees. I have a series of blog posts that cover Cottonmouth myths here: http://davidasteen.blogspot.com/search/label/Cottonmouth%20Myths, including those I just mentioned. Cottonmouth snakes are not aggressive, so you’re indeed lucky. They only attack and bite human when threatened. 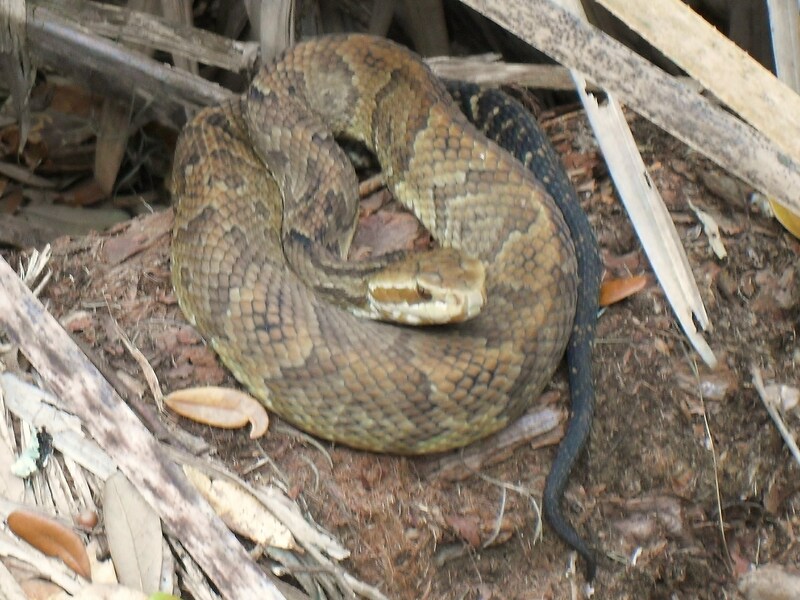 Although there are very few reports of deaths due to cottonmouth snakes’ bites, the fatality from their venom is rare. Previous Previous post: You Can’t See Me! Next Next post: Squirrel Skull?